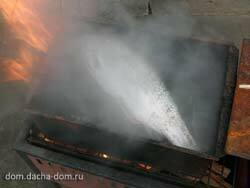 The fresh fish (salmon or trout) is the best choice for home smoking. You can use store-bought ice fresh fish or quick-frozen fish. 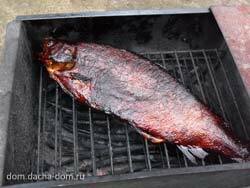 The just caught salmon or trout can be smoked well without any brin dip. But supermarket fish will be more tasty if you will use the brin for the fish smoking preparation. The easiest way is to use the bolled water and the sea salt. Rinse fish in fresh water and trim all loose pieces. Take 1/4 cup of sea salt for each 0.22 gal. 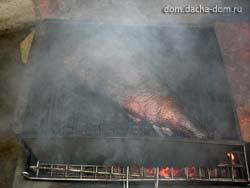 of water (1 liter of water) and let the fish soak overnight (minimum 8 hours). Use glass, plastic or ceramic container for soaking ( but never wood or metal). Place fish in the solution, being careful to insure that the fish is completely covered with the brine. Store it in the refrigerator. 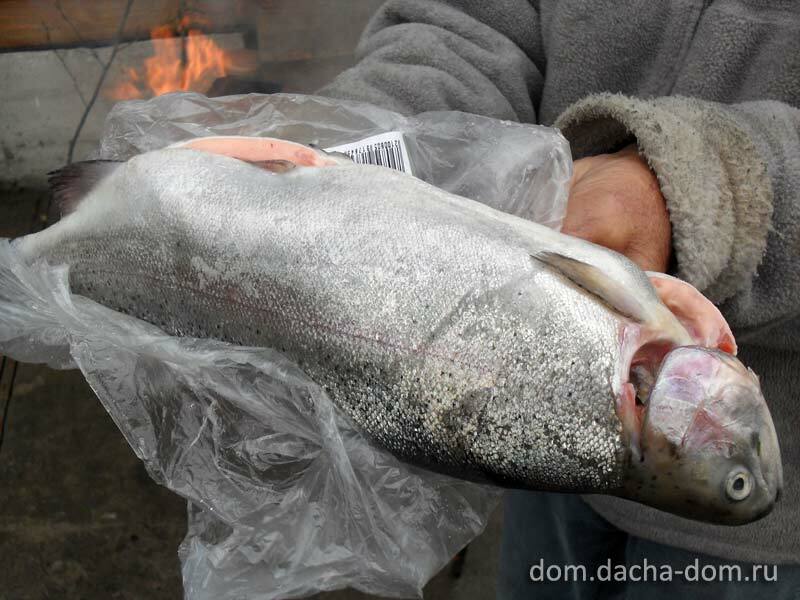 The just caught salmon or trout can be soaked for just 2 hours. Set of tarragon, basil, and marjoram or set of curry powder and coriander. In 1/2 hour before the smoking take the fish container from the refrigerator and open it. What to do next? 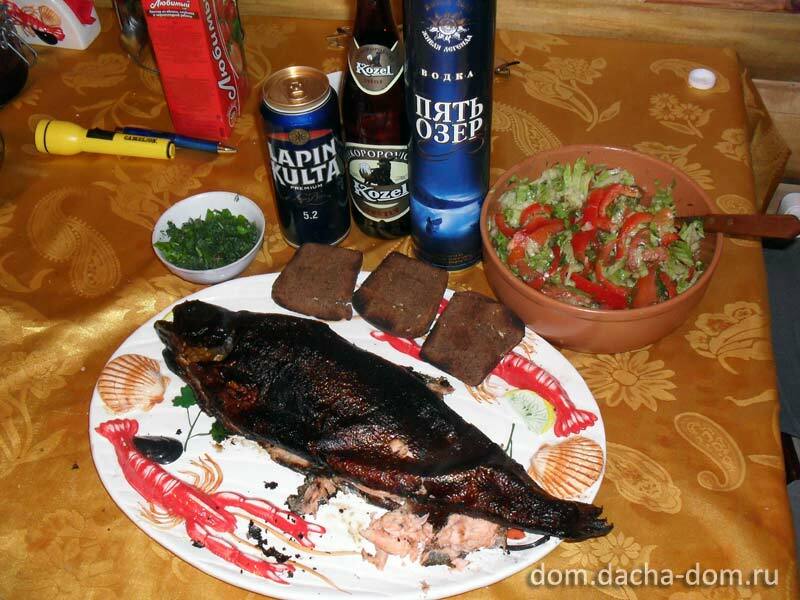 Here is the Russian fisherman's directions how to smoke salmon or trout. 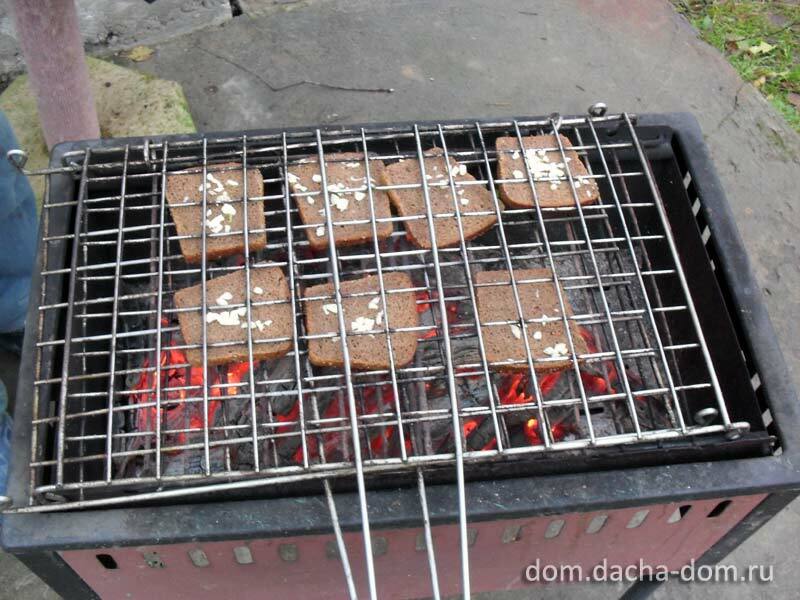 This easy-to-make smoke direction will give you delicious results. 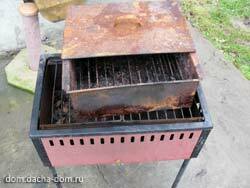 The simple smoker is a metal box with a grill inside. 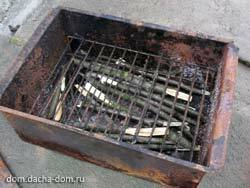 The wood is place below the grill and the fish is placed over the grill. 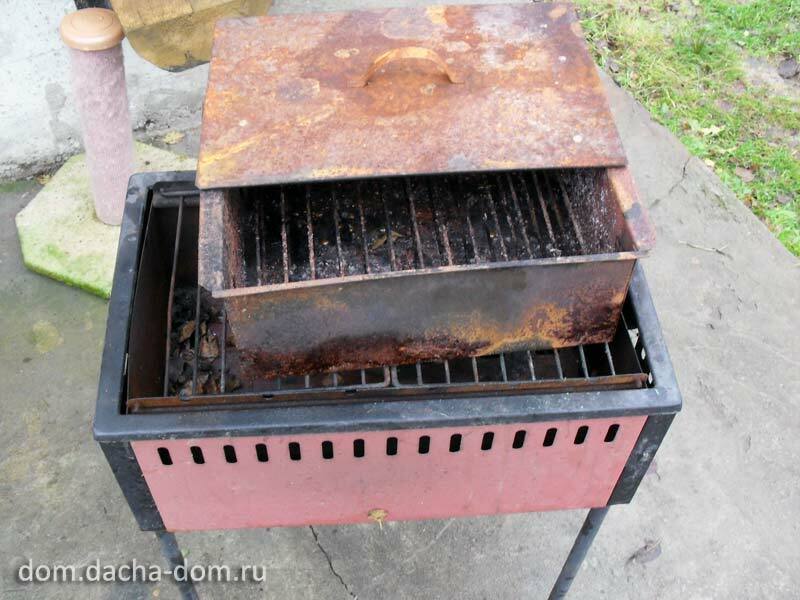 The box is closed with the metal cover. 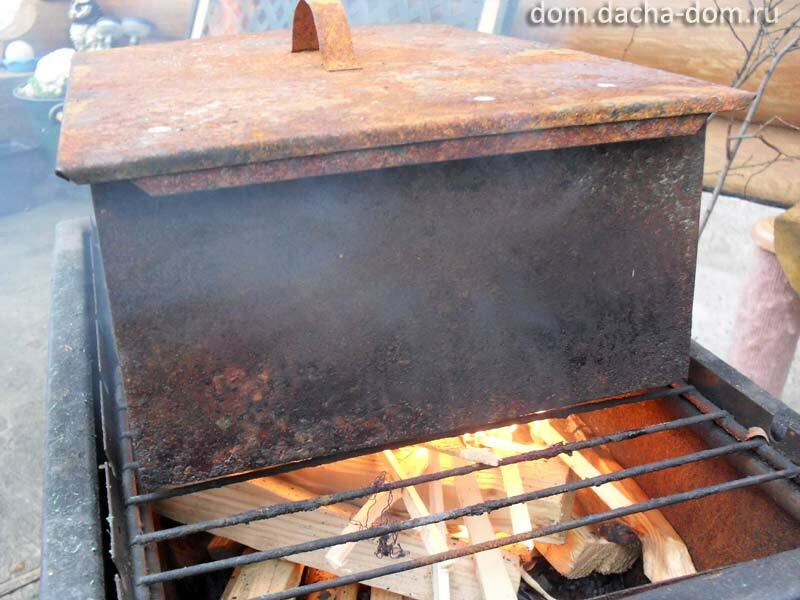 Place the smoker over the open fire. We use the char griller to heat up the smoker. 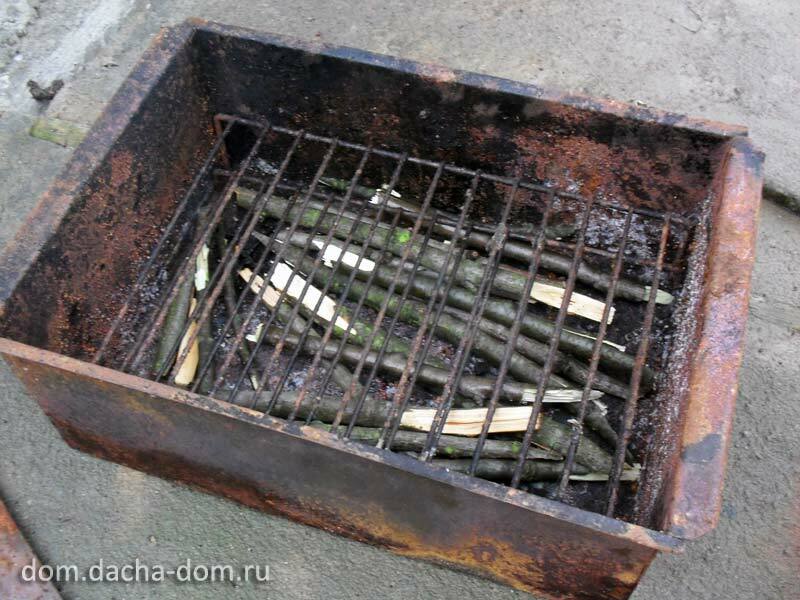 The master secret of Russian fish smoking is smoking wood choice. Alder is a very abundant species in the Pacific Northwest. The smoke is light and flavorful and has been the traditional wood used to smoke salmon. 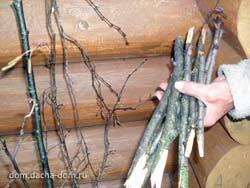 For upscale delicious taste add a few juniper branches to your alder branches. 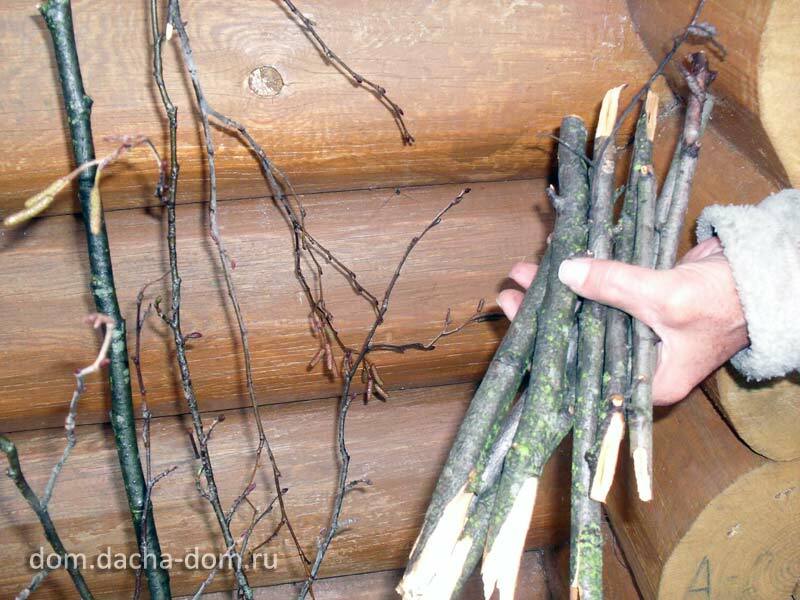 We use finger thickness alder branches with the bark for fish smoking. 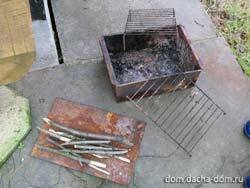 Put a smoker grill over the alder branches. 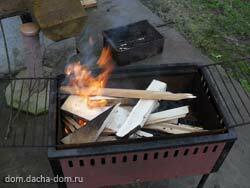 Fire up wood in a char griller and let it flame well. Put the smoker box onto the fire. 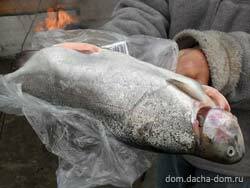 Rinse trout in fresh water and trim all loose pieces. 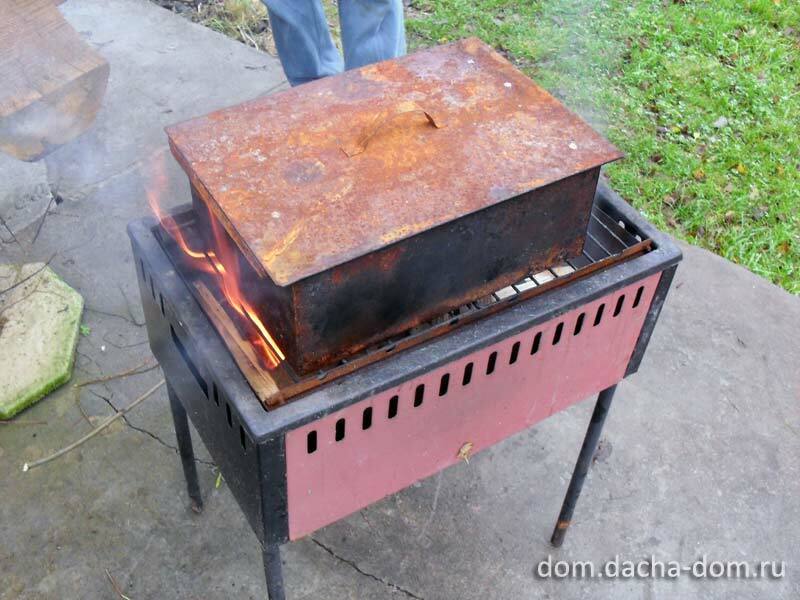 Place fish on a smoker grill and cover it. Watch the time and the fire. 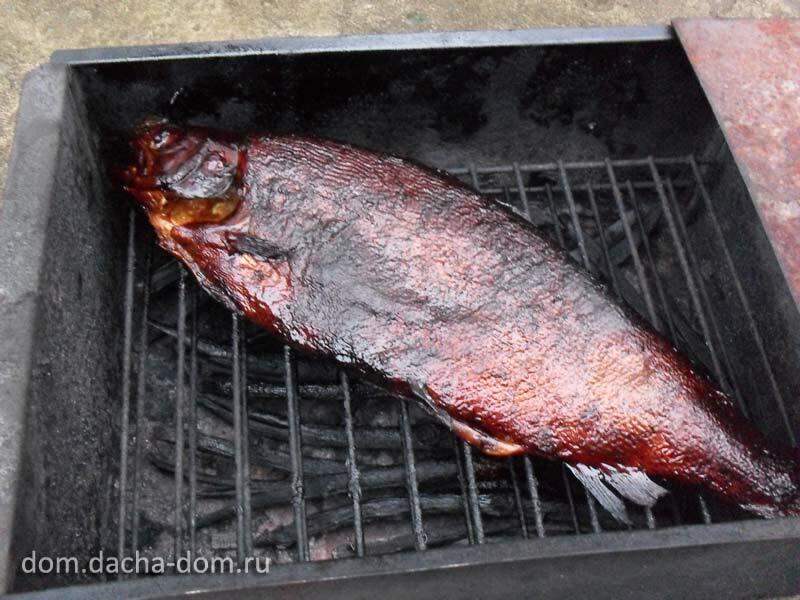 The fish smoking time is 30-45 minutes. 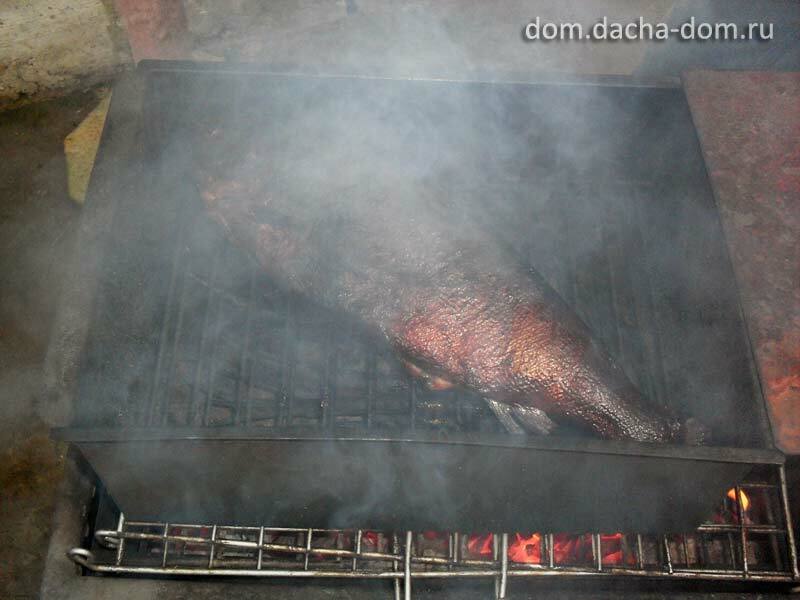 The well smoked trout becoming well tanned. 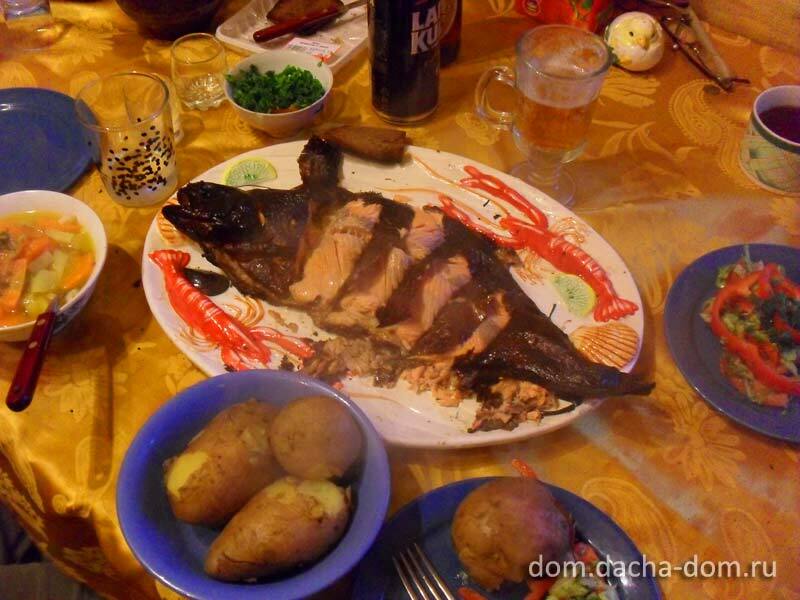 The smoked trout. 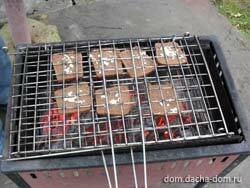 Fry the bread with onion and garlic with the rest of chars.